Welcome to the monthly e-bulletin of the South Asia Media Solidarity Network (SAMSN). The next bulletin will be sent on August 15, 2018, and your inputs are most welcome. India’s federal National Investigative Agency (NIA) summoned Kashmir Observer daily’s Srinagar-based journalist Aqib Javed Hakim to New Delhi and questioned him on July 14 and 15 over an interview, relating to a sedition case registered against a woman separatist leader. The NIA summoned accredited journalist Hakim to New Delhi, 900km from Srinagar, and after his appearance questioned him about the interviews he had done and types of news stories he had written. He was also asked questions regarding his personal background in connection to a sedition case filed against Asiya Andrabi, a separatist leader who was moved to New Delhi from Srinagar Jail, whom he had interviewed in past for a magazine. More here. Kadafi Zaman, correspondent of Norwegian TV2 channel in Pakistan, was beaten up and arrested on July 13, in Kotla, Punjab while covering a protest demonstration. He was held for three days before being released on bail on July 16. The journalist was covering a protest rally ostensibly called to welcome Nawaz Sharif and his daughter Maryam Nawaz, both leaders of Pakistan Muslim League Nawaz (PML-N) as they returned to the country from Britain to face years of jail after being convicted on corruption charges. Read more. 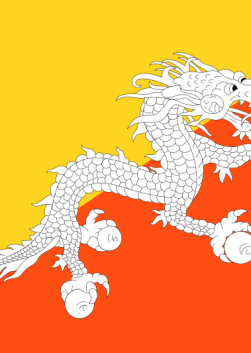 Angered by New York Times daily’s investigative reporting detailing how China seized ownership of a seaport in Sri Lanka, a group of Sri Lankan lawmakers denounced the newspaper on July 3, focusing their ire on two local journalists who contributed for the report. The lawmakers, allies of the former president Mahinda Rajapaksa, held a televised news conference in which they claimed that the journalists, Dharisha Bastians and Arthur Wamanan, were working on behalf of the current government to malign Rajapaksa. The news conference came after a days-long campaign on social media to discredit the journalists, who provided logistical help for the article. Read more. Pakistan’s media, journalists and bloggers are facing unprecedented threats and harassment ahead of the July 25 elections. The July 25 vote will mark the first time the country has held three consecutive elections without a coup, but the armed forces are still believed to wield considerable power behind the scenes. Critical media, journalists and even social media users have received intimidation, kidnappings and threatening phone calls. Read more. The Free Media Movement (FMM) Sri Lanka has called for solidarity to abolish the Press Council after President Maithripala Sirisena decided to appoint a Board of Directors to activate the Sri Lanka Press Council Act, which is opposed by those advocating for press freedom. The FMM believed the decision as acting against one of the election promises of the Present President by which he confirmed media freedom. One of the main agreements to which FMM and many civil society organizations arrived with the present President during the election was the abolishment of the Sri Lanka Press Council. Read more. Two former Sri Lankan police officers accused to have roles in killing of prominent editor Lasantha Wickrematunge have been granted bail by a court on July 17. Mount Lavinia Magistrate Court’s Chief Magistrate Mohammed Mihal released the two suspects on a cash bail of Rs. 50,000 for each with two personal bonds of the closest relatives for Rs. 1 million each. The two officers, former OIC Sugathapala and the Senior DIG Prasanna Nanayakkara, are accused of concealing and destroying information pertaining to the murder of the former Sunday Leader editor who was gunned down in Colombo in 2009 and are key suspects in the case. Read more. The police in Sri Lanka are inquiring about and has asked sources of information to present themselves to police after Neth FM broadcasted a program over an incident involving Deputy Minister Palitha Theverapperuma. According to Neth FM, the Deputy Minister has inquired them about those parties who provided information for the program, but they have not released the sources of information. The Police however obtained information about telephone calls received by Neth FM from its listeners, and those listeners have been asked to report to the police station. Read more. WhatsApp has become a valuable tool for many journalists in Pakistan. Journalists have joined numerous groups that have journalists and non-journalists as members and news travels through this channel faster and to large numbers of people. Whatsapp is a tool for communicating, but how will it impact journalism? Read more. The largest democracy in the glove maintains its status as a hazardous place for journalists. 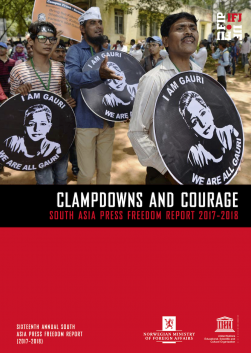 India reported the murder of four journalists in the last six months and its troubled neighbor Pakistan follows with the casualties of two scribes. 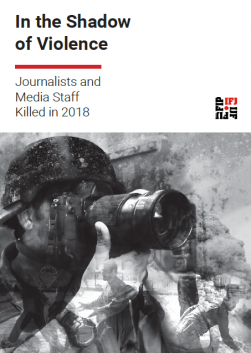 Another neighbor Bangladesh reported the murder of one editor-publisher since 1 January, whereas other countries in the Indian subcontinent namely Nepal, Sri Lanka, Bhutan, and Maldives evaded any incident of journo-killing in this period. Read more. The security establishment is trying to push a certain narrative on the Pakistani public ahead of the July 25 elections. For those who follow Pakistan’s domestic affairs closely, it is clear that this effort to silence independent voices in the media is part of an attempt to unlawfully engineer the country’s political landscape. Read more. 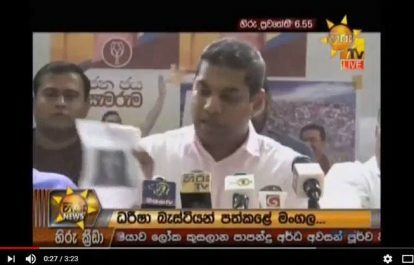 Photo: A screenshot from Groundviews’ YouTube channel, an opposition politician shows a photo of journalist Dharisha Bastians to a press conference.